Welcome to the Computational Genetics research group of the Department of Computer Science and Biomedical Informatics, of the University of Thessaly, Lamia, Greece. Group leader is Pantelis G. Bagos (Professor in Bioinformatics and Biostatistics). In these pages, the interested visitors may find relevant information concerning our research and teaching activities, information concerning the people working with the group and access the various computational tools and software that we have developed. Our research is focused on the computational analysis of biological sequences (DNA, RNA and proteins). 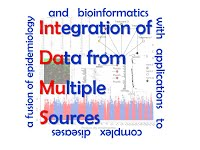 Our main research interests include prediction of protein structure and function from the primary sequence, development of stochastic models for analyzing biological sequences, large-scale genome analyses, development of methodology for genetic association and gene expression studies (See more).